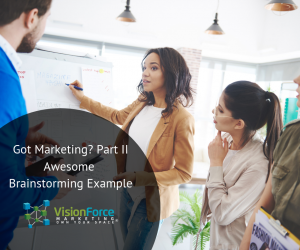 Last week I wrote about the importance of brainstorming sessions in developing your marketing and business strategy in Got Marketing? Part I, so this week I’m going to provide you with a glimpse into the possibilities with brainstorming. Although the following is completely a figment of my imagination, it is a representation of what I’ve experienced in how great ideas take shape. For readers who have never stopped to think about the impact marketing has on your own consumer consumption, my hope is you will start to look at things in a new light and find a way to apply sound marketing principles to your own business. There’s a reason we pay an insane premium for convenience coffee, and no it has nothing to do with inflation or scarcity – it’s all marketing. You are about to become a fly on the wall in an imaginary conference room so you can witness for yourself just how trends and good marketing transpires. Conference room; 8:00 am on any given Monday at We Make Coffee Corp. Silence. Marketing team blankly looks at each other. Vice-President of We Make Coffee Corp.: “Ok, people let’s not get too side-tracked here. Let’s keep talking about this caf/decaf dilemma, do you think that’s common? Marketing Genius #1: “Hmm, I know I would like to just make one cup some days but will skip the whole process because it’s too much work with the filter and measuring all for one cup. And, I’d also like to not have to start all over with the whole process, wish I could just push a button and my husband’s coffee would be done in 60 seconds! Marketing Genius #3: “No measuring, no more wasted coffee, added convenience and if they believe the coffee is fresher I bet we could ask a 40% premium! Perception is reality my friends! Ok, so that was purely a product of my imagination. I have no way of knowing what actually went down, but what I can tell you is this is exactly what happens when teams are allowed to brainstorm. Strategic planning and product strategy sessions are usually much more lengthy and involved but don’t fool yourself, sometimes ideas do flow this quickly and this is how huge ideas are born, and those ideas become a Marketing Plan and when executed, it turns into new consumer trends, millions of new products sold and a multi-billion dollar industry. So, if you either brewed a single-cup coffee for yourself this morning or stopped off for your morning java at the ubiquitous white and green-logoed store this morning, you did so as a result of brilliant marketing. Marketing done well – works. And, it can work for your company. So one final time, I ask . . . Got Marketing?